I’ve always had a soft spot for word games. When I was a kid, my family often gathered around the dining room table to play Boggle. (My mom, who was also a master at crossword puzzles, usually trounced us all.) My younger sister and I played Scrabble a bit, too, though in my memory we were consciously and even intentionally terrible at it. We’d trot out sad, low-scoring words and cackle about them. (“LIDS.”) I got deeply into Scrabble many years later, even played in a few tournaments. That’s a story for another day, suffice to say I realized it was all making me a little bit insane. So, these days I stick to lighter word games. Thankfully there are some very clever ones out there that give you the joy of the hunt without tempting you into the craziness of memorizing word lists. One of my recent favorites does tempt you into a different sort of madness, however. A touch of insanity can be the key to winning Unspeakable Words. 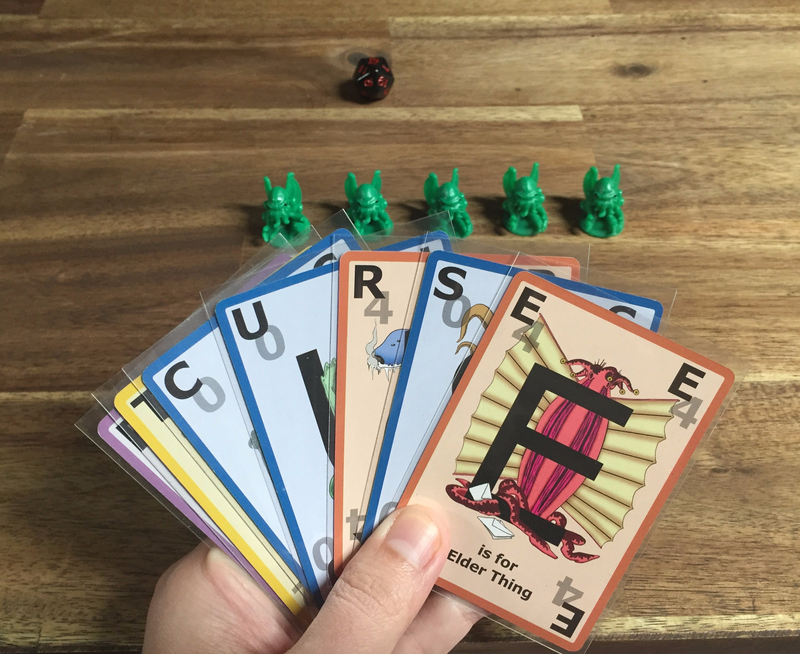 In Unspeakable Words, each player begins with five adorable little Cthulhus. They represent your sanity points so, as with most Mythos-themed games, you shouldn’t get too attached to them. You’re also dealt seven cards, most of which have letters on them. In a Tindalosian twist, each letter has a score based on how many angles it has. For example, Z is only worth two points, while the letter E is worth four. Scoring more is not necessarily better, however. All those angles make you vulnerable to the Hounds of Tindalos. After you create your word and announce its score, you must roll a d20 to determine whether you overcome their threat to your sanity. The interesting thing here is that you keep the points no matter what. If you make a successful roll, you also keep your sanity. If you don’t, you say goodbye to one of your Cthulhus. The first player to score 100 total wins the game, but must do so with at least one Cthulhu left. There’s another twist, too. When you’re down to just one sanity, you can make up words. This requires two things. First, you must define the word. (Reach into the depths of your nearly insane mind. The answer is there.) Second, you have to make the sanity check. With a successful roll, you collect the score and keep playing. If you fail, you’re out of the game and drifting in the void until the next round. There are a few other cards along the way that make things interesting, too. 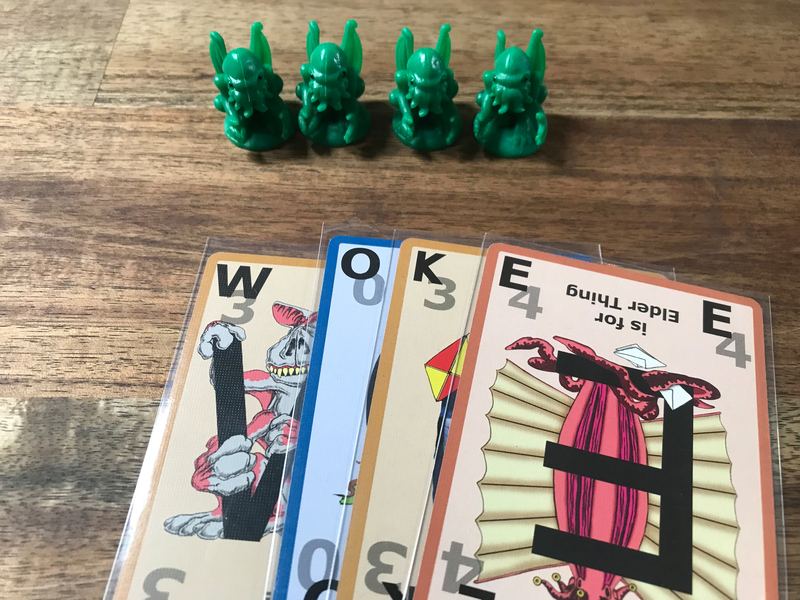 For example, there’s a Hounds of Tindalos card you can play on an opponent’s word to increase the value of one letter to six. If you’re lucky enough to pick up the Elder Sign card, you can play it to regain a Cthulhu after a successful sanity check. The Yellow Sign card allows you to reroll a failed sanity check, which is especially useful in the end game. Not yet insane enough for this one. 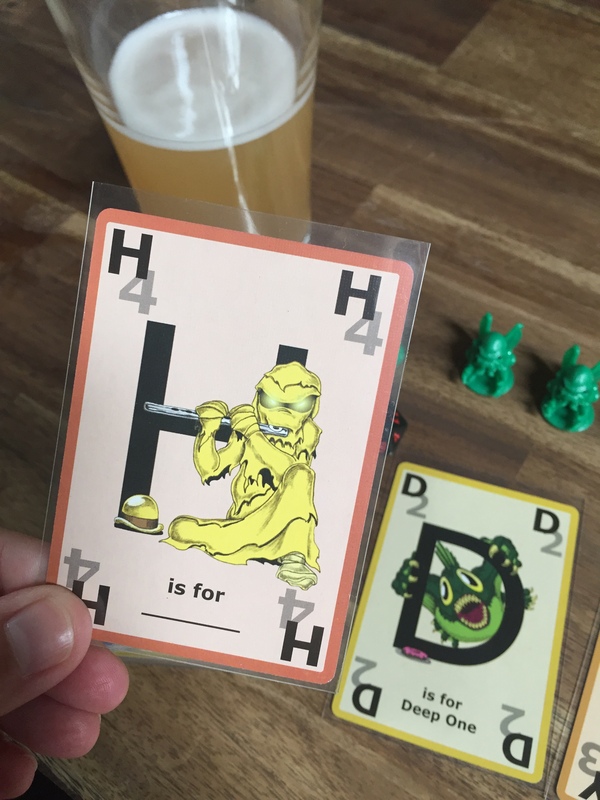 Unspeakable Words an absolutely wonderful, low-stress pub game. 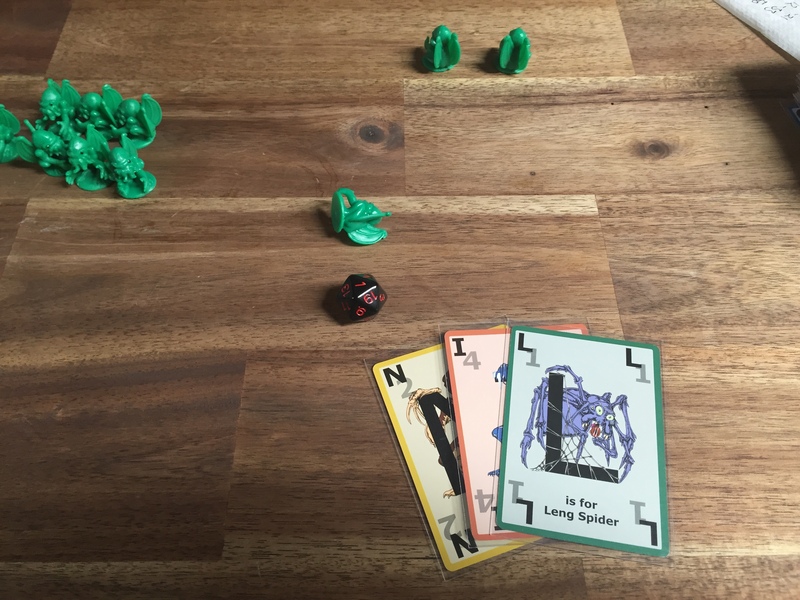 So far we have only played it with two players, but apparently it plays up to six. Now and then someone hems and haws over a move, but the choices tend to be simple enough that games go quickly. It’s easy to teach, too. Although it’s competitive, the press-your-luck aspect really takes the pressure off. In fact, I find myself sharing the angst of my opponent when they choose a safe, low-scoring word yet still fail the sanity check. Whenever they take a risk on a high scoring word, I’m totally rooting for them. (Note, this is not because I’m a Cultist. *shifty eyes*) . 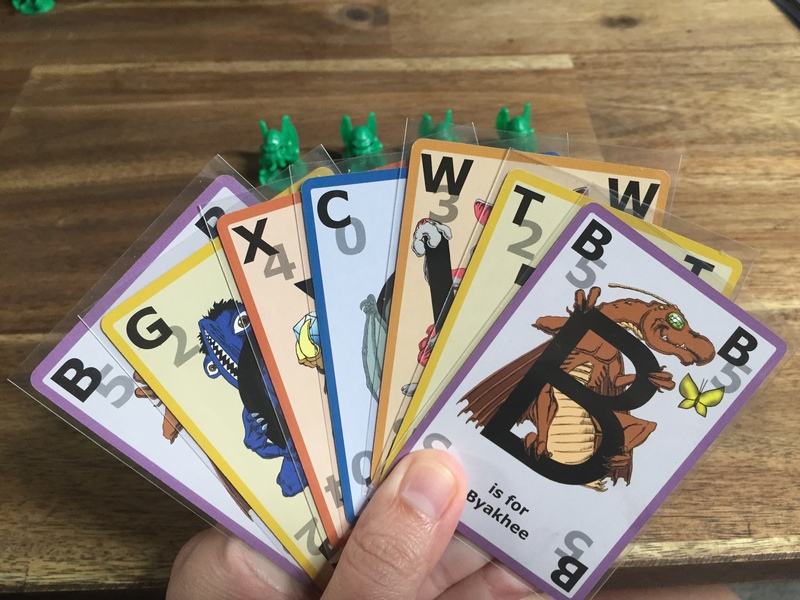 Unspeakable Words is simple to prep for pub play. Once you protect the cards (with 63.5 x 88mm sleeves), you’re all set. If you remove the components from the original box, the game packs down quite small, too. The deluxe version of the game includes a drawstring bag that would be handy for portability, too.